If you have not figured out yet, I am a big fan of NFC (Updates 1, 2 and counting..)and the mobile money! I have been quite busy lately and haven’t had time to put down some more ink on my Payment Paradigm (1, 2, 3…) series. So, in lieu, I wanted to share some quick updates…. (2) Google Wallet Launch – Google Wallet launched earlier this month. In my opinion, Google Wallet is a sort of walled-garden program whose partners are CitiBank, MasterCard and Sprint. Walled-garden, because the choice of partners precludes a broader customer base. Only if you have an account with Citi and are you are a Sprint customer with a Nexus S, can you actually go ahead and use Google Wallet. I view this program as more of a pilot than anything else (at least for now). (3) Fruit Ninja goes NFC – Some time ago I wrote about the Angry Birds getting angrier with NFC :). To recap, Rovio unleashed new location based levels when one would ‘Tap the Tag’ (NFC tag, that is) at select locations. And viola! You’d get access to new levels that the rest of the world doesn’t have a clue about. Lucky you! Now, the Ninja’s are on the loose with NFC. Same concept here – except that you’ll have more fruit to filet with your samurai swords in various locations. But beyond Angry Birds and Fruit slashing Ninja’s, gaming companies are beginning to unlock the potential of NFC to differentiate themselves. And this is just the beginning. Expect more to follow. (4) iPhone5 NFC speculation is rife – The iPhone5 is just around the corner and the drum beats have begun. Months ago, NFC was not on the cards, but now the pundits are predicting NFC on the iPhone5. If it does appear on the iPhone, then NFC will receive a huge boost and my guess is that there will be a mad scramble to get an ecosystem in place in order to get a lock on the dollars. On the other hand, Apple could play it safe and wait for the ecosystem to mature up to an extent and then release an NFC iPhone. We shall see as the wait will be over soon. (5) More phones are becoming NFC compliant – Here’s a quick list of the NFC enabled phones available in the US – Google Nexus S, BlackBerry 9900/9930/9350/9360/9370, Nokia C7 Astound/N9. Samsung Galaxy S II is rumored to be NFC enabled, and we’ll find out for sure when they launch. It’s not a huge list, but slowly and steadily vendors are adding to this list. Expect more. (6) What’s a QkR (Quicker)? – An initiative by MasterCard that combines QR codes, Audio, Microsoft Kinect and NFC. I thought QkR is a really cool moniker to describe this concept and this QR code centric initiative goes beyond the Google Wallet to enable mobile payments to a lot more consumers. MasterCard foresees the appearance of QR codes on say a distribution channel such as TV (HSN or QVC or other network channels). And it just so turns out that you are watching HSN and you see something that really piques your interest. You whip out your phone and from your couch scan the QR code that’s displayed on the TV screen and make the purchase. How cool is that? And you don’t see the bill until you get your credit card statement! Alternatively, the advert would also emit a high-frequency sound (pulses, continuous wave, who-knows-what) that can be detected and decoded by your mobile phone receiver to take you a landing page that will allow you to make the purchase. Groovy eh! Video and Audio cues apart, now with Kinect (Xbox 360) rolled in to this technology, customers could use gestures to essentially make purchases. Not very sure how gesture based buying will play out with consumers. But the goal is to get the couch potatoes to reach out to their wallets and not the bag of Dorrito’s. (7) NFC now being covered by Gartners ‘Hype Cycle’ – Hmm, often times these things don’t live up to the hype, but in the case of NFC there could be a point here. Gartner is famous for the Magic Quadrants and the Hype Circle. While the Magic Quadrant evaluates vendors across multiple vectors, the Hype Cycle looks at various (“Hyped up”) technologies of the past-present-future eras. It also denotes the typical technology adoption curve, something akin to the Bass model (Product Diffusion Curves – S shaped curve) or the Roger’s Product Adoption/Innovation curves (Bell curve akin to a Normal Distribution curve). 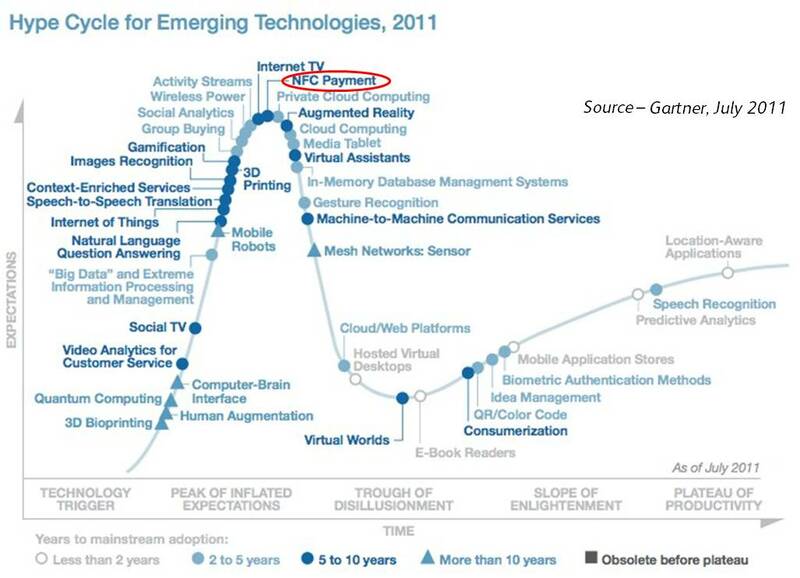 You’ll notice that NFC is at the very apex of the Hype curve. Very high expectations for sure. Will NFC live up to the hype? I, for one think so. It will require all the forces (MNOs, Payment Networks, Banks/Financial Institutions, POS guys, Retailers, Ecosystem providers and Consumers) to come together. And I do think that these forces will come together, forget their differences and party around the bonfire – all in the name of…. ‘$ – THE BIG DOLLAR – $’! They say, it (Money, I mean) is a great equalizer. Would you agree? This entry was posted in Mobility and tagged Blackberry, Galaxy, Google Wallet, iPhone, iPhone5, Kinect, MasterCard, MasterCard Labs, Nexus S, NFC, Payment Paradigm, QkR, QR Codes, Tap the tag. Bookmark the permalink.